VBoxHeadlessTray50Setup.exe - for VirtualBox 5.0 (Thanks to Andy Hawkins who did almost all the work on this). Select a machine from the displayed list. VBoxHeadlessTray will powerup the machine. If a VBoxHeadlessTray machine is running when Windows is shutdown, it will automatically save the machine's state and on Windows restarting, VBoxHeadlessTray will restart itself automatically and resume the VM. To prevent a machine starting at windows logon, exit VBoxHeadlessTray before shutting down windows, or use the -np option. Added two new commands "Open VirtualBox GUI" and "Go Headless" that switch between the headless hosting of the machine and the main VirtualBox GUI. Note the machine needs to be saved and restored to perform this switch. Reorganised the context menu a bit. Fixed icon tray state reflecting state of incorrect VM. Due to apparent bugs in VirtualBox itself (not send machine state change notifications), the tray icon may be a little slow to update when starting and stopping the VM through the VirtualBox GUI. VBoxHeadlessTray 3.2 requires VirtualBox 3.2 to be installed. VBoxHeadlessTray 1.2 requires VirtualBox 3.1.2 to be installed. Machine execution, machine management and all other functionality is still supplied by Virtual Box. VBoxHeadlessTray is a simple front end that hosts VirtualBox runtime. Testing on Windows XP, Windows Vista and Windows 7. 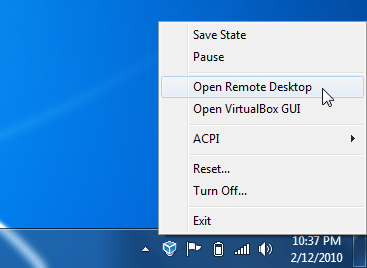 It is possible to customize the context menu that appears when clicking on the VBoxHeadlessTray tray icon. This is done through VBox Guest Properties. Say the of the VM being hosted was running a web site and you want a quick way to launch a web browser for it. At the command prompt, use the VBoxManage tool (see VirtualBox documentation) to add the following guest properties. VBoxManage guestproperty set devvm "VBoxHeadlessTray\ContextMenus\browse\menutext" "Open Web Browser..."
VBoxManage guestproperty set devvm "VBoxHeadlessTray\ContextMenus\browse\command" "http://toptensoftware.ulamp"
VBoxManage guestproperty set devvm "VBoxHeadlessTray\ContextMenus\browse\verb" "open"
If verb is empty, the command is executed (CreateProcess) otherwise it's launched with ShellExecute. You can optionally set another property to specify the context under which the commmand is available (either Running or Stopped). VBoxManage guestproperty set devvm "VBoxHeadlessTray\ContextMenus\browse\context" "Running"
Source code for VBoxHeadlessTray is available from github. Right click .nsi file again and choose Compile. Set the .nsi file properties back to Excluded from Build. This manual building of the setup is due to the fact that we need both x64 and Win32 exe's for the setup program and Visual Studio doesn't provide a way to do this easily. VBoxHeadlessTray by Topten Software is licensed under a Creative Commons Attribution-Noncommercial-Share Alike 2.5 Australia License.